This Tuesday morning, the spotted Active Low Pressure Area (ALPA) at the east of Mindanao has developed into a Tropical Depression, according to our Philippine weather expert. 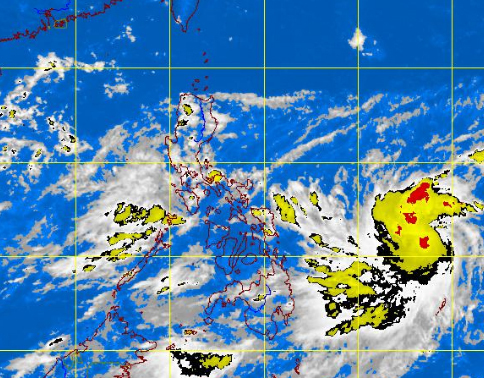 PAGASA named ALPA as Bagyong "Karen." PAGASA weather bulletin advisory as of 2:00 a.m., "the Active Low Pressure Area (ALPA) was estimated based on satellite and surface data at 760 km East of Hinatuan City (9.3°N, 133.8°E) embedded along the Intertropical Convergence Zone affecting Southern Luzon, Visayas and Mindanao." PAGASA forecaster Ricky Fabregas said on dzBB radio, "Ang nagpapaulan sa atin simula kanina ay ang thunderstorms na dulot ng ITCZ. Patuloy makakaapekto ang ITCZ sa Southern Luzon, Visayas at Mindanao." He added that in Metro Manila we will experience thunderstorms in the afternoon or evening. Meanwhile, PAGASA said, "Tropical Depression "KAREN" is still too far to affect any part of the country." Update - September 11, 2012 - 6:00 p.m.
"At 4:00 p.m., Today, Tropical Storm "KAREN" was estimated at 800 km East of Guiuan, Eastern Samar (10.7°N, 134.0°E) with maximum sustained winds of 65 kph near the center and gustiness of up to 80 kph," based on satellite and surface data gathered by PAGASA. Comments or suggestions about "Tropical Storm KAREN Update September 11, 2012" is important to us, you may share it by using the comment box below.